I live on the third floor in a new apartment building in the Jordaan in Amsterdam, so I don't have a basement, and unfortunately that means I don't have a wine cellar. But cellars are not an uncommon feature among Amsterdam's older houses; whether or not they are suited for wine storage is another question. Among other things, a good cellar requires ventilation. But there are some truly amazing cellars or caves in Amsterdam. 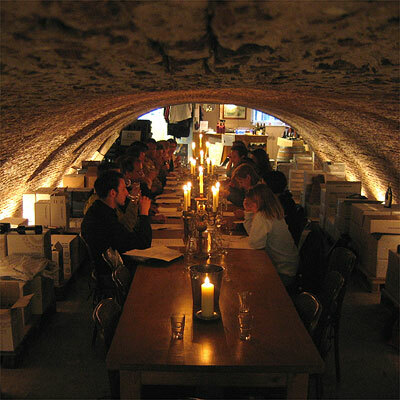 My personal favourite is the cave of the Corvershof, built in 1723 and is now the location of Tastevin Dehue and wine educator Sander Salburg's Wines Unlimited, on the Nieuwe Herengracht. A tasting here by candlelight is a truly unique experience. Such a beautiful old cellar does however come with a price: several years ago, the brick walls and roof started leaking, requiring them to pump a special foam into the masonry, an expensive undertaking. Yes, there definitely are beautiful cellars in Amsterdam, I just don't happen to have one. So I did the next best thing: I used my ground floor storage space (known in Dutch as the "box"). It's in a shady part of the building, is locked and is generally quite cool. In fact, I have to say after monitoring the temperature over the last year, I'm quite impressed. When the mercury rose to close to +30º Celsius this past summer, the box stayed reasonably cool at 15º. And as I write this, with the outside temperature being -6º, the box is a balmy +7º. I know this is not completely ideal, but look it's not like I'm storing Lafite-Rothschild down there. My box is not meant for long-term storage of wine, at least I don't think it is. But as for the question "how does rosé age," the answer is not very well. We all know rosés should be drunk young, though quality rosés have a slightly longer life. So I was rather chagrined to find, while poking around in my "cellar" recently, that I still had two bottles of rosé from 2005. Not extremely old but getting onto four years now. The good news is this is quality rosé: Reuilly, François Charpentier, a full-bodied, mineral style Pinot Gris rosé vinified in the same way as a red wine, six weeks of skin contact at 6° Celsius and a slow, cool yeasting. I sell this wine and enjoy it often in the summer; I know it well. And so my first taste led to disappointment: the wine had lost its fruit, both in the nose and the mouth. But it was a bit thick in the mouth; that was something new. And there was just a subtle hint of raspberry. Above all the wine was mineral, dry, and the more I drank it the more I was pleased. This was actually quite special, like a dry aged quality Sauvignon Blanc with a hint of red fruit, if you will. And then there are people who say Sauvignon Blanc doesn't age well either, but this is Pinot Gris. That last bottle is for me. However the '06 is available, and I would recommend laying a few bottles around for 2010. I know I will. By the way, don't try this with your supermarket rosé.